The Greater New Haven Clean Cities Coalition, Inc. (GNHCCC) is a 501(c)(3) non-profit organization that furthers the use of alternative fuels and advanced technology vehicles. We were first designated a U.S. Department of Energy (DOE) Clean Cities Coalition in October 1995. The GNHCCC covers New Haven County and other areas of Connecticut as it handles federal grant projects. The GNHCCC brings together stakeholders in the public and private sectors to deploy alternative and renewable fuels, idle-reduction measures, fuel economy improvements, and emerging transportation technologies. The goal is to improve air quality, support economic development, increase energy security, and reduce dependence on petroleum. We do this by providing education and training, technical expertise, networking opportunities, and funding assistance to our stakeholders. GNHCCC was designated in October of 1995 as a coalition of the U.S. Department of Energy’s Clean Cities Program. Nationally, there are nearly 100 Clean Cities coalitions that advance the nation’s economic, environmental, and energy security by supporting local actions to reduce greenhouse gas (GHG) emissions and cut petroleum use in transportation. To learn more visit the National Clean Cities website. The United States relies heavily on foreign oil to power its transportation sector. Our country imported about 40% of the petroleum it consumed in 2012, and about two-thirds of these imports came from outside North America, according to the U.S. Energy Information Administration. Lee started the New Haven Clean Cities coalition in 1995 and has served as the coalition’s coordinator for the last 20 years. As part of his Clean Cities mission, Grannis has developed projects and obtained federal and matching funding for compressed natural gas, liquefied natural gas, light duty electric vehicles, electric transit, hydrogen hybrid, and biodiesel projects, and related outreach project funding. He has provided alternative vehicle and fuel consultation and assistance to many organizations in Connecticut and outside the state, including several towns and cities, metropolitan transit authorities, utilities, community colleges, universities, laboratories, and airports. He serves as an on-call advisor to Connecticut state government staff and Connecticut’s U.S. Congressional and Senatorial staff. Recently, his coalition, in partnership with the three other Connecticut Clean Cities coalitions and 27 other partners, was awarded $29 million (including partner match) from the U.S. Department of Energy for alternative fuel infrastructure and vehicle deployment in Connecticut. Grannis was selected as the Northeast Region Clean Cities Coordinator of the Year in 2004 and 2008 and was inducted into the national Clean Cities Hall of Fame in 2012. In 2016 Grannis was awarded the Benjamin Watson Inspirational Award from the Clean Cities Coordinator Council. Grannis retired after 23 years as a lieutenant colonel infantry from the U.S. Army. He held several combat and logistical positions, which included two combat tours in Vietnam. He attended several military schools and is a graduate of the U.S. Army Command and General Staff College. Grannis has a Bachelor of Arts Degree from Eastern Kentucky University in Political Science and a Master of Arts in Public Administration from Central Michigan University. Grannis is on the Board of the Greater New Haven Transit District, and was recently elected the organization’s treasurer. Paul worked his way up from Clean Cities stakeholder to board member to co-coordinator. Paul Wessel leads the integration of the Parksmart parking and transportation certification into the GBCI family. Paul was previously the Executive Director of the Green Parking Council, a national 501(c)(3) organization developing and dispersing green parking practices through certification and credentialing programs, open-sourced standards, professional leadership and educational development and training. GPC worked at the intersection of parking, green building, clean technology, renewable energy, smart grid infrastructure, urban planning and sustainable mobility. Earlier, Paul served as the Deputy Economic Development Administrator and the Director of Traffic and Parking for the City of New Haven as well as a board member of the New Haven Parking Authority and the Greater New Haven Transit District. Under his leadership, the City introduced new electric vehicle shuttle buses, upgraded parking enforcement and meter technology and dramatically increased parking revenue. He currently sits on the board of and co-coordinates the Greater New Haven Clean Cities Coalition. Paul has extensive experience in legislative and community advocacy, foundation and non-profit engagement in community development and municipal economic development. He holds a M.S. in Urban Policy Analysis and Management from New School University and a B.A. in History from Wesleyan University. Nearly 15,000 stakeholders contribute to Clean Cities’ goals and accomplishments through participation in nearly 100 Clean Cities coalitions across the country. Private companies, fuel suppliers, local governments, vehicle manufacturers, national laboratories, state and federal government agencies, and other organizations join together under Clean Cities to implement alternative-transportation solutions in their communities. We work with fleets of all vehicle sizes, vehicle numbers, and vocations to find ways to reduce petroleum consumption through the use of alternative and renewable fuels, advanced vehicles, and other fuel-saving measures. Many different fuel options exist which can help displace petroleum consumption and reduce emissions. These fuels are defined in the Energy Policy Act of 1992 (EPAct) including biodiesel, electricity, ethanol, hydrogen, natural gas, propane. Alternative fuels may include both renewable and non-renewable fuels, and interest in their use is expanding among the general public as well as large fleets. Although availability of different fuels has sometimes been a challenge in the past, refueling infrastructure is expanding throughout the country and specifically Connecticut to meet the growing demand. Biodiesel is a domestically produced, renewable fuel that can be manufactured from vegetable oils, animal fats, or recycled restaurant grease for use in diesel vehicles. Biodiesel’s physical properties are similar to those of petroleum diesel, but it is a cleaner-burning alternative. Using biodiesel in place of petroleum diesel, especially in older vehicles, can reduce emissions. To find out more about biodiesel, visit the US Department of Energy’s biodiesel website or you can download a PDF fact sheet to print out. Electricity can be used to power all-electric vehicles (EVs) and plug-in hybrid electric vehicles (PHEVs). These vehicles can draw electricity directly from the grid and other off-board electrical power sources and store it in batteries. Hybrid electric vehicles (HEVs) use electricity to boost fuel efficiency. Using electricity to power vehicles can have significant energy security and emissions benefits. To find out more about powering cars with electricity, visit the US Department of Energy’s electricity website or you can download a PDF fact sheet to print out. You can download a list of available EVs, PHEVs, and fuel cell vehicles (FCVs) with data including make, model, year, range, MPGe, MSRP, federal tax credit, and the Connecticut Hydrogen and Electric Automobile Purchase Rebate (CHEAPR) incentive amounts. Ethanol is a renewable fuel made from corn and other plant materials. The use of ethanol is widespread—almost all gasoline in the U.S. contains some ethanol. Ethanol is available as E85—a high-level ethanol blend containing 51%-83% ethanol depending on season and geography—for use in flexible fuel vehicles. E15 is defined by the Environmental Protection Agency as a blend of 10%-15% ethanol with gasoline. It is an approved ethanol blend for model year vehicles 2001 and newer. To find out more about ethanol, visit the US Department of Energy’s ethanol website or you can download a PDF fact sheet to print out. Hydrogen, when used in a fuel cell, is an emissions-free alternative fuel that can be produced from diverse domestic energy sources. Research and commercial efforts are under way to build the hydrogen fueling infrastructure and produce hydrogen fuel cell vehicles that are practical for widespread use. To find out more about hydrogen, visit the US Department of Energy’s hydrogen website. Natural gas is a domestically produced gaseous fuel, readily available through the utility infrastructure. This clean-burning alternative fuel can be used in vehicles as either compressed natural gas (CNG), liquefied natural gas (LNG), renewable natural gas (RNG), or biogas. To find out more about natural gas, visit the US Department of Energy’s natural gas website or you can download a PDF fact sheet to print out. Propane, also known as liquefied petroleum gas (LPG) or propane autogas, has been used worldwide as a vehicle fuel for decades. It is stored as a liquid, and propane fueling infrastructure is widespread. To find out more about propane autogas, visit the US Department of Energy’s propane website or you can download a PDF fact sheet to print out. Compare the latest quarterly national average price report. Find and compare alternative fuel vehicles (AFVs), engines, and hybrid systems for light-, medium-, and heavy-duty vehicles. As vehicle technology continues to advance, the variety of vehicle types available is increasing rapidly. Consumers and fleets can now choose to purchase vehicles that use an alternative fuel, an advanced hybrid powertrain, all-electric vehicles, energy-efficient diesel, or simply a highly efficient conventional gasoline engine. More choices, such as fuel-cell vehicles are on the horizon. The Department of Energy provides a list of energy-efficient technologies that are offered on many vehicles available today. AFVs are available either as conversions or as original manufacturer equipment, and come in both light-duty passenger vehicles and heavy-duty vehicles and equipment. Alternative fuel vehicles (AFVs), as defined by the EPAct, include any dedicated, flexible-fuel, bi-fuel, or dual-fuel vehicle designed to operate on at least one alternative fuel. To the right are the definitions of each type. Designed to run only on the alternative fuel. Capable of operating on gasoline, E85, or a mixture of the two. Designed with two separate fueling systems that allows for operation on natural gas or propane and conventional gasoline. Requires both alternative fuel and diesel fuel storage and delivery systems. Mainly developed for heavy-duty applications-usually out of warranty. Read through the list that provides a snapshot of the vehicles available. The Alternative Fuels Data Center (AFDC) hosts an online database (afdc.energy.gov/vehicles/search) that is regularly updated and may contain more vehicles and data than were available when originally published. More than 250 million vehicles consume millions of barrels of petroleum every day in the United States. On-road passenger travel alone accounts for more than 2.5 trillion vehicle miles traveled each year. You can use strategies and techniques to conserve fuel which will save money. Find out how to reduce fuel costs, engine wear, emissions, and noise. Connecticut anti-idling regulations prohibit vehicles of all kinds from unnecessary idling for more than 3 minutes. You can find out about more Connecticut anti-idling efforts. GNHCCC and its stakeholders have received several grants throughout the past few years! Click on the tabs below to find out what projects are being funded thanks to these awards. The Greater New Haven Clean Cites Coalition, Inc. (GNHCCC) partnered with Plug in America to promote and demonstrate plug-in electric vehicle (PEV) use by establishing local Connecticut showcases that provide a hands-on consumer experience and in-depth education in a variety of venues. The project will help promote the use of PEVs to reduce greenhouse gas emissions and dependence on petroleum in transportation. The project also covers the Northeastern states Rhode Island, Massachusetts, Connecticut, and Vermont. Visit www.FairfieldEVshowcase.org to see our first event of the project. Public fleets are seeing huge benefits from the deployment of electric vehicles (EVs). By eliminating fuel consumption, EVs reduce costs to fleets, promote energy independence and help protect the environment. Although EVs are increasingly becoming a successful application for fleets, higher incremental costs, procurement processes, and insufficient charging infrastructure remain as critical barriers to adoption. EV Smart Fleets seeks to address these barriers by aggregating state and local fleet purchases for EVs and charging stations through a multi-state aggregated EV solicitation and procurement agreement. EV Smart Fleets will leverage the purchasing volume of public fleets across the country in order to reduce vehicle and infrastructure costs, improve contract terms, provide access to a wider range of EV models, and expand access to charging infrastructure. This multi-state procurement will be issued and managed by the National Association of State Procurement Officials (NASPO) through its ValuePoint Program. 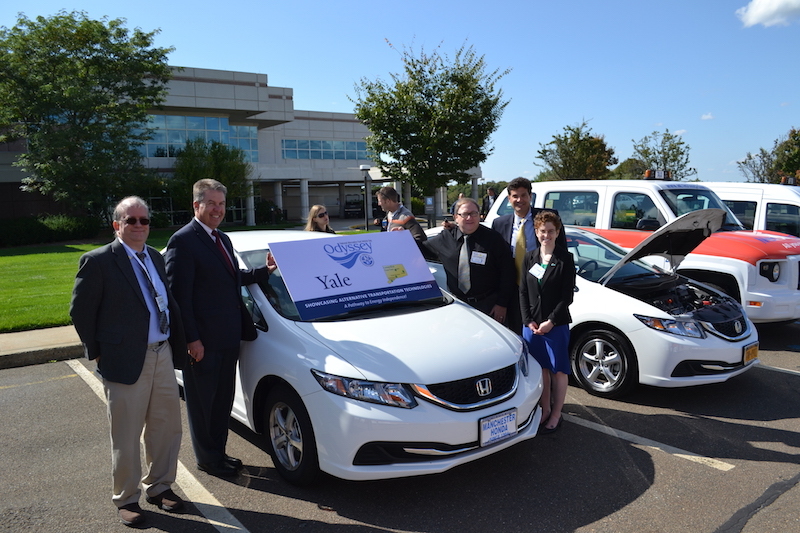 The Greater New Haven Clean Cities Coalition, Inc. (GNHCCC), together with over 30 partner organizations will develop and implement a state-wide, fuel-neutral effort that will deploy 269 alternative fuel vehicles (AFV) through incremental funding and provide fueling capability for 21 additional fleet vehicles and infrastructure necessary to directly support the vehicle deployments as part of the Connecticut Clean Cities Future Fuels Project. The project will increase the utilization of alternative fuels; strengthen the availability of alternative fuels for fleets and commercial consumers along major corridors in the state; raise awareness and foster greater understanding of alternative fuels and advanced vehicle technologies through a targeted outreach and education effort; create and retain jobs; reduce dependence on foreign oil; reduce harmful emissions; and contribute to a sustainable alternative fuels market. Funded in FY2008, the BioWatz Project allowed the GNHCCC to work with Chris Glynos at BioPur, Inc., located in Bethlehem, CT, to build on the biodiesel production facility operated by Glynos. The project engaged an integrated team to design, develop and deploy a Power Generation System at the BioPur facility which would enable the production of electricity with biodiesel. The project proved to be very successful, allowing Glynos to sell his renewable power to the local power company — after he uses some of it to provide power for the biodiesel production facility. The project collected data through a system designed and installed by Sabre Engineering of Colorado and Innovation Drive, the project management firm provided support to the growth of this operation. The federal project officially ended in late 2010. 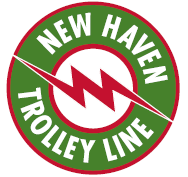 The City of New Haven in conjunction with the GNHCCC deployed an electric trolley system in downtown New Haven during the early 2000’s. E-Bus of Downey, California built four 22 foot dedicated electric trolley replicas that had the capability of both standard battery charging and fast charging. The batteries were charged with “Green Electric Power” derived from waterpower, wind and solar. The project provided a clean alternative fuel for public transportation. Everywhere the electric trolleys were put into service, mass transportation ridership increased dramatically because people appreciated the electric power train’s smooth, quiet, non-polluting ride. By going with the electric trolley technology, a reduction in dangerous soot particles associated with standard diesel powered buses was realized, as well as reducing the number of fuel trucks carrying foreign fuel to the vehicle refueling locations. Click on the icons below for more information and resources on Clean Cities and Alternative Fuel Vehicles. Click on the tabs below for more information on how you and your organization can get involved. Becoming a member of the Greater New Haven Clean Cities Coalition (GNHCCC) provides stakeholders access to a variety of benefits that promote their success. Industry-wide networking, access to expert technical advice, statistical data and funding opportunities through state and federal sources represent just a few key benefits of membership. Simply stated, being a stakeholder in a Clean Cities Coalition means being a member of the largest group of committed individuals and organizations in a nation supporting energy independence, petroleum reduction and environmental consciousness. If you are interested in becoming a stakeholder with the Greater New Haven Clean Cities Coalition, please fill out the contact form (in the footer) or contact Lee Grannis via phone at 203.627.3715 or email grannis@nhcleancities.org. Contribute to Greater New Haven Clean Cities Coalition to continue our efforts to achieve a more energy independent and cleaner air future. Your tax-deductible contribution ensures our ability to decrease petroleum consumption. We thank you for your continued support. To donate, please email Lee Grannis at grannis@nhcleancities.org. Click on the tabs below to watch our videos. You can find all of our videos and more on our YouTube Channel at GNHavenCleanCities. Find more videos from the event in our Zero Emission Vehicle playlist on YouTube. Experience test drives in different electric vehicles, find out about charging availability, why people love their electric vehicles, and more. Electric Car Week from bruce lomasky on Vimeo. Click on the posts below to read more about that news story. You can also read all of the news stories here. The award was received for the coalitions work with propane school buses, most notably Yale University’s propane school bus fleet. Feel free to contact the GNHCCC Coordinator, Lee Grannis. Does your organization operate a fleet? How many vehicles are in the fleet? How many vehicles do you want to work with? Does your fleet employ fuel efficiency measures? Choose all that apply. What vehicle technology are you interested in? Choose all that apply. Are you exploring alternative fuels and/or vehicles? Are you searching for incentives? Are you inquiring about fuel tax information? Are you interested in alternative fuel training? What type? Choose all that apply. Would you like to become a stakeholder? 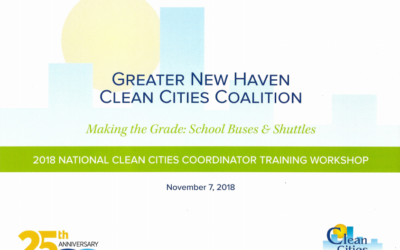 Greater New Haven Clean Cities is one of four coalitions in the state of Connecticut. Together, the four coalitions cover the entire state. For more information about the other Connecticut coalitions, please contact the appropriate coalition coordinator.